The effect of gun laws on shootings in America has long been a source of heated debate. Part of the reason: new laws have largely been implemented piecemeal across the country, meaning it’s difficult to measure their impact. The country has enacted almost no new restrictions on gun ownership at the federal level in more than a decade. It has mostly fallen to states to police the spread of firearms—or not. However, the data we do have is still illuminating. 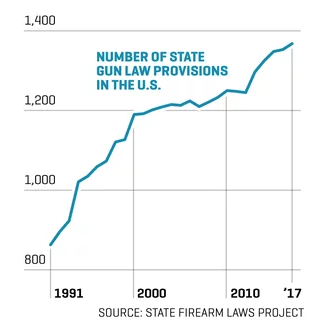 In attempt to gauge the impact of such laws, Fortune plotted the number of gun provisions in each state, using research by the State Firearm Laws project, against each state’s gun homicides, using Gun Violence Archive statistics. Correlation does not equal causation, but the revealed trend is striking: States with more gun provisions consistently see fewer gun deaths. Most, but not all, U.S. states have enacted their own firearm-related laws over the past 25 years. The number of firearm-related provisions has risen by more than 50% since 1991. However, the increase is largely concentrated in a few states like California, Connecticut, and Massachusetts. Others (like Alabama and Tennessee) repealed more rules than they enacted.